I meant to work on my novel today, but ended up blowing it off. Had lunch with one of my brothers though, who is also working on a book and spent some time complaining to each other how we needed to get back to work. Mark made a comment that if he "only had a laptop" to work on it would be easier to write more consistently. Man, have I ever been there. If I only has a word processor. If I only had a computer. If I only had a laptop. I've made many upgrades in technology over the years and have learned that none of it motivates you. It may make the job easier, but if you want to write, you don't need technology to do it. Thinking that you do is just a procrastination technique. Tomorrow is the first day of NaNoWriMo. I need to write a chapter (about ten pages) a day to get done by the end of the month. It takes me a good couple of hours to do that, assuming that I know when I sit down to write how the chapter's going to begin and end and something about the middle. Two hours a day for 30 days is going to be very difficult for me, but it's doable if I don't let myself be distracted by other things. I've got a perfectly good library at home from which to write, but I've also been on the look-out for a good place to get away and write. Even in my library there are distractions. David loves going in there to play and I'm only a shout away if Diane needs something. I've got next week off from work and it'll be a great time to get some serious work done on Le Corsaire, but there are a couple of days that Diane and David will be home, so that's why I'm thinking about this right now. Beau Smith interviewed Gail Simone once and she took him to her Writing Place, a non-pretentious diner where the waitresses know her and she has a Usual. I like the idea of that, but I haven't found that place yet. There's a hippie coffee shop not far from my house, but it's as pretentious as you can get. They do have outlets to plug the laptop into though. So, here I am, posting this from Barnes & Noble. The atmosphere is nice and it's too popular to be pretentious, but the staff will never know my name or offer me the Usual. The real reason this could never be my Writing Place though is that there's no outlet and I've only got as long as my battery lasts to get any writing done. On Monday I'll try out the hippie coffee shop and see how I like it. It won't be as busy, but that's not necessarily a good thing. I can drown out background noise and there's something inspirational about having lots of different people -- each one a potential character or story -- wandering around you. Maybe I'll look around B&N for an outlet. Forgot to mention that I've got a new Shake It, Salome up about Conan #3-6, much to the chagrin of some members of the Robert E. Howard Yahoo! group. I actually support the second guy's right to disrespect any Conan material not written by Howard. The guy's a Howard fan and that's cool. I'm a Conan fan, and -- whether it's cool with this fellow or not -- that's not going to change. The first Conan story I ever read was written by someone other than Howard, so I guess I'm tainted. What's funny though is the first dude's assertion that I've been "co-opted" by Dark Horse. As if I'm somehow on their payroll because I like their comics. I wish. I wrote an essay for SteveNiles.com about the history and importance of Halloween. I got a nice email today from Necromancer's writer Josh Ortega. I've been posting his email newsletters on Comic World News and he wrote to thank me. Apparently folks are reading because he's been getting a lot of emails since then. In his last update he mentioned that he's going to be working on a new Star Trek project and about a week after I posted it, the news was on all the Trek fan sites and Wikipedia. I never feel like I'm writing in a vacuum on my blogs, but I don't get a lot of feedback on CWN except for people asking to be removed from the weekly newsletter list, so stuff like that's nice to hear. Speaking of the newsletter, I recently subscribed to the Super Hero News group on Yahoo! and was pleasantly surprised to find out that my newsletters are redistributed to a bunch of other folks via that list. Also nice is that Johanna Draper Carlson mentioned in her blog that David Lewis's manga column on CWN is one of her must-reads. I've passed by the opportunity to participate in National Novel Writing Month since I learned about it a couple of years ago. My friend Grant Gould is giving it a try though and that got me rethinking it. I've always passed on it because, given my writing speed, it seemed like an unattainable goal to finish a novel in a month. It still does. But, my goal for this year was to get my first draft done and I'm only about 30% towards that. I might as well give it a concerted effort in November to see if I can get it finished. Learning not to edit as I go should hopefully speed me up. And I've got a head start. I'm not sure if a head start is cool with the Official Rules of NaNoWriMo (very fun to say out loud, by the way: "nanorimo"), but I'm not looking to win anything here, except the satisfaction of finishing. Frankly, I'm not enthusiastic about my prospects of finishing in November, but I'm gonna give it a good shot. Forgot to mention last week that another comic came out with "Completely Cold" in it: Night Mary #3. Night Mary is a fantastic series anyway by Rick Remender and Kieron Dwyer, so you should get it. It's sort of like Dreamscape or The Cell in concept and the art is amazing. Apparently, CSI: NY -- Bloody Murder #4 comes out this week. That means that I completely missed the third issue, which had "Cold" in it. This week, Land of the Dead #2 comes out and I'm in there too. Another insight from Angela Booth's Writing Journal. She talks about letting your first draft be messy and describes it as "making mud." You can make something cool out the mud later. I'm not as bad as I used to be when I would send each chapter out for criticism and try to perfect it before moving on to the next, but I still need to work on this. I'm more comfortable with the idea of mud, but I'm like a little girl in her Easter dress, just sort of poking and pushing it around without jumping in and playing. Maybe I'm taking the analogy too far though. Her point is that you need to just write and not worry so much about perfection, which is advice I've gotten from other authors and am already forcing myself to implement by not going back and reading previous chapters. I still tend to edit as I write though. I’ve been aware for a while now that the name Comic World News is a misnomer. I’m very proud of this site and I love it as if I created it myself, but let’s face it, it’s never been a news site. We have the best damn pundits on the internet and I like to think that our reviews are strong, but that makes us an opinion site, not one that reports the news. I don’t wanna change the name – I like the name – but a while back Columns Editor Shawn Hoke and I discussed the idea of adding a column that was more news-oriented. Not a purely journalistic column – that would be amazing, but we need baby steps here – but sort of a weekly news wrap up with commentary. That would at least get us started in the right direction. We tossed around some names as possible columnists, but never settled on anyone. Recently, though, I’ve been thinking again about the idea of CWN as a news site and how to make that happen. More frequent – and regular – posting of news items and interviews is one way and we’ve been doing that for a week or so now, updating the Headlines and/or Interviews sections of the site three times a day. I’m shooting for at least one new interview a week. This column is a third way and, as you can see in the byline, I’ve taken a do-it-yourself approach. Not out of desperation, but because I found myself drifting towards news commentary in the weekly CWN Newsletter anyway and figured I might as well start doing it for real. As I told Shawn when I pitched the idea at him, I’m not afraid of snarking when it’s deserved, but that’s not what this column is about. I’m going to keep this light, but I’m also going to try to actually think about news stories before I assume that the people they’re about are idiots. I don't like to do interviews for the mere purpose of promoting someone's book. In fact, I'll go so far as to say that I don't do interviews when that's the only purpose for it. But when I heard that Sea of Red's Salgood Sam was illustrating a new Planet of the Apes comic, I wanted to know more about it, so I asked him some stuff. New Conan column is up at PopThought. Covers Conan the Barbarian #3. Still catching up with Angela Booth's blog and ran across this post from last week. It confirms something that I've started to learn this year and that's that writing has to be enough. There are an endless set of goals that writers set for themselves: get published, get paid to write, quit the day job, win an award, etc. I've talked to Big Time writers who still don't think that they've "made it," because there's always that next milestone to reach. I really want to be able to make enough money writing that I can stay home and work in my skivvies, but I'm starting to realize that even if that never happens, I love writing enough that I'll keep doing it. That realization is somehow equally saddening and liberating. FanFiction.Net respects the intellectual property of others, and we ask our users to do the same. Quote du Jour: "If they all liked it, it would probably be crap." Newsarama has a cool interview with Carnivale's Daniel Knauf this week where he talks about his upcoming plans for Iron Man. My favorite bit is when he's asked about the online fan reaction and talks about writing to please fans. "I expected it and as I said, I totally understand it. Fans are very protective, and that’s the way it should be. I’m confident, though, that they’ll be relieved as soon as the books are released and they see that we’re delivering the character with a fresh perspective and real verve while keeping a respectful eye in the rear-view mirror. "We don’t want to reinvent Iron Man – he’s already been invented fine, thank you. But there are two new sheriffs in town [he'll be writing Iron Man with his son --MM], and we plan on kicking things up a notch or three. Some folks might not like what we do, but most of them will dig it. "If they all liked it, it would probably be crap. "I think top-notch anything requires a certain amount of risk-taking. If you don't take risks, what you end up with is paint-by-numbers. Everyone'll recognize the subject, nobody'll be offended, but nobody'll be thrilled either. A big part of my job-description is to be thrilling. "And that, by the way, is not necessarily incompatible with engaging a mainstream audience. I'm sure David Goyer upset a few Tim Burton fans with Batman Begins, but it was still a home run." I'm posting this primarily as a reminder to myself. It goes back to the Steve Niles quote from a while back about not trying to write a story that will "grab the readers' attention," but just writing what thrills you. It's starting to sink in, but I can't hear it enough. One of the first web comics I ever reviewed was Paul Taylor's excellent Wapsi Square. Paul was at FallCon last weekend and made a nice, well-rounded report about it. 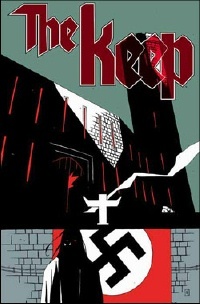 IDW's The Keep #1 comes out today. That's cool to me for a couple of reasons. First, it's the fourth comic to come out with "Completely Cold" in the back of it. I'd be excited even if it weren't though. At the time I read it, F. Paul Wilson's The Keep was the creepiest book I'd ever read. I've been meaning to go back and read it again to see if it holds up, but regardless, it's really cool that Wilson is writing the comics adaptation himself. And that I'm in the back of the first issue. And this is me on Sunday, sketching the Cownt on a jam poster for charity. Too lazy to mess around with getting these pictures into the previous post. This one is from Saturday. Darla drew a table mascot for herself called "Michael Fey." This is me looking very Burl Ives next to it. I had a great experience at FallCon this weekend. Due to my misreading the invitation, I was an hour and a half late to the bowling deal Friday night. Fortunately, Grant, Jess, and Darla were still there and I got to hang out with them and treat them to the unforgettable sight of me chair-dancing to "Lady Marmalade" and "YMCA." Not my favorite music, but difficult to sit still to. Grant suggested that next year they should make it karaoke instead of bowling, an idea I wholeheartedly endorse. We had some food and visited, but weren't in the mood to bowl, so after a while we got out of there and went to Pizza Hut for more food. Got to the fairgrounds early and set up for the con. Visited with Alex Ness most of the day, picked up a few comics I'd been wanting, bought some art (including a piece by Darla that I'd been lusting after for a while), sold a few copies of Tales from the Inner Sanctum #2, reaffirmed that everyone loves the Cownt and that a comic featuring him would sell like hotcakes. Lots of people "ooh"ed over the preview I had of Three Days the Devil Danced. I expect that it'll sell very well too assuming the price is right. I also spent some time talking to an artist friend who's going through a rough patch creatively. It was actually a very encouraging conversation for me because of how seriously this person takes his work. It would be easy for him to coast on the success of previous stuff and just do "more of that," but he wants to grow and improve and is struggling to evolve to whatever he's going to become next. I need to take my work that seriously. Myself, never. My work, definitely. I didn't sell anything on Sunday, but it was a worthwhile time anyway. I bought some more comics and art and visited with more friends, but what made the day was a couple of pieces of cool news that I heard and can't talk about. One involving another artist friend; one involving me. If something comes out of either, I'll rejoice in public, but it's waaaay too soon to do that just yet. Grant and I helped set up for the convention last night and, like the primadonnas we are, asked the convention coordinators to move around seating to suit our pleasure. As a result, I'm now sharing a table with buddy Alex Ness and our table will be right next to Grant's, whose will be next to a table with Jess and Darla. And we're all within note-passing distance of Adam Hughes. I also noticed that Jennifer has a table assigned already and that there are plenty of spare tables available for Andrew, so no one will need to be crowded. Got home last night and Diane was making Cownt tails that you can clip onto your pants. It's a variation on the monkey and lion tails she made for David to wear and play with. I'll have a couple (Collectors Items!) to sell at the con. Tonight, the convention staff are hosting a night of bowling and pizza for the creators. I'm a terrible bowler, but I love to do it. Should be a blast. Did I mention that FallCon's coming up this weekend? I'm so excited I can't sit still. I'm sharing a table with the lovely and talented Darla Ecklund; hopefully one that's nearby the also lovely and talented Jess Hickman and Grant Gould. Grant and I are heading over to the fairgrounds tonight to help set up. Darla doesn't know it yet, but there's a waiting list of people who'd like to share our space if they can't get tables of their own. I'm not going to inconvenience Darla, but I don't mind giving up some room on my half of the table for either Jennifer Young or Andrew Ritchie. Lots of other people I'm looking forward to seeing and/or hanging out with, but I'll refrain from making a list lest I forget someone. Salome: Conan and the "Legions of the Dead"
After an unannounced (and unintentional) hiatus, "Shake It, Salome" is back at PopThought with the next article in the Conan series. 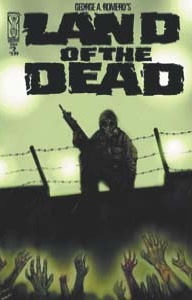 This one looks at L. Sprague de Camp and Lin Carter's short story, "Legions of the Dead." Trying to think of some ways to improve Comic World News. Got a couple of ideas in the works, but the first thing I'm doing is giving myself a column. I'd resisted that idea, thinking that whatever I had to say could be said in the weekly CWN newsletter. The problem with that thinking though is that it makes the newsletter the destination, not the site. I'm thinking now that the newsletter ought to just tease readers into visiting the site and that if I want to comment on comics-related stuff, I should be doing it in a real column. A while back, CWN's Columns Editor Shawn Hoke and I talked about starting a weekly comics news wrap-up column that talked about the big stories of the week with commentary. We never thought of a great person to write it though and the idea fell by the side of the road. I'm resurrecting it and making it my column, which we'll be calling "That's News to Me" with apologies to Kevin Nealon. Gav and I are thinking about the Quartet of Crime concept and maybe just focusing on the Cownt. We're still talking it over, but he's obviously everyone's favorite character (including ours) and maybe it's better to just deal with him. Not sure how that's going to affect the Quartet of Crime one-shot that Gav's currently working on. Starting to get some more comments on "Completely Cold." One of the members of Steve Niles's forum gave me a nice quotable review: "It's ten minutes of your life you will not want back." My friend Shara, who's always been very candid with her comments when she's proofread my stuff, liked it and said that it deserved to be published. You don't know Shara, but that's high praise from her. And Jason Copland told me it's "excellent" and "very visual," which is cool because I think visually when I'm writing and it's nice to know that translates into images forming in the reader's mind. No IDW comics coming out this week, so no "Completely Cold." Thank you, Grant. You're a sick man.